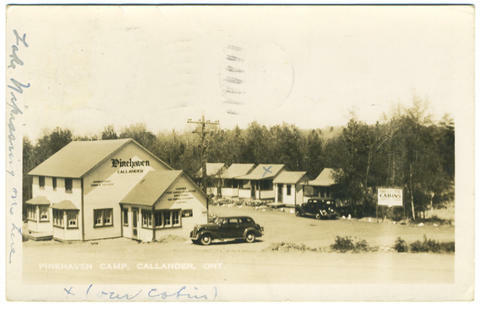 Item 030 - Pinehaven Camp, Callander, Ont. On the front left side: Lake Nipissing over here. Card was cancelled at North Bay, Ontario, 17 July 1937. Card addressed to: Miss Eleanor Orr. 363 Flint St. Rochester. NY. U.S.A. Message reads:7/16/37 Here is where we are hanging out. Just living the life of Riley. I heard from Edna that Sunny is better and I am gland. Maude.